April's competition saw the top three entries all feature Malcolm from Anim School. They final ratings were so close, but Max Loubaresse pipped top spot! I loved the cinematography, the snappy timing and certainly the comedy. My favourite moment was when Malcom's eye opens on playing dead. I had to grab the opportunity to talk through his diverse portfolio of work. His work is loud, fearless and full of appeal. C'est beau! Growing up, when did you know you wanted to become a professional artist? As a kid I didn't like to draw. I was bad at it. As a teenager I was the nerdy type, no friends, playing video games, watching lots and lots of movies, reading comics and mangas... and I liked drawing. So you would think that going into an Animation school is an obvious choice. And still it took me several years to figure that out. I don't know exactly why. I just had a very limited vision of the world I guess. I knew I wanted to make movies when I was 17-18 yo. I had these CDs from the french Playstation magazine with short movies from the french school Supinfocom. I loved these so that's how I discovered I wanted to work in Animation. Is Supinfocom the school you attended? Supinfocom is a CG Animation school from France. They've got two buildings, one North and one South where I studied. The South Supinfocom changed its name and is now called MOPA. While I was there I rediscovered the joy of having good grades and also the pride of doing good work. The best part of a school like that is the students, 50 people who love what they do, influencing each other, challenging each other. It's something that is missing in the professional life I think. So, the Supinfocom degree takes 5 years to get with a graduation short movie to present at the end. Except I left school at the end of the 4th year. I failed to convince my teachers to let me do the kind of graduation movie I wanted. Because of my past work, they envisioned for me something serious and dramatic when I wanted to do something light-hearted and fun. I left and so did two of my friends. We made our own "graduation" short movie, called "Salesman Pete", outside of school during what was supposed to be our 5th and final year of studies. Your adventures in the animation industry have taken you from France, to Australia and to England. What was it like working in these countries? - My professional experience in France is not very common so it would not reflect anything relevant about the country itself. Let's just say I don't see myself working there anytime soon. - Working in Australia was awesome for me. I spent two years there and one day, I'd like to go back. Sydney is an awesome place to live in - People are very friendly, open-minded, talented definitely more relaxed and less superficial than in Europe. I am a very shy person and It was a lot easier for me to make friends in Australia than in Europe. The downside is that interesting companies and projects are more rare. Budgets are much lower too in Animation. So the quality suffers. Australia deserves more animation opportunities and backup from its government. Did you experience any language barriers and if so, how did you overcome? One of my friends who came to Australia had a pretty bad level of English but he managed perfectly. People in our industry are often patient and understanding so it helps a lot. I enjoy the graphic nature of your work, illustrated through your personal art and also your animation. Who were your early influences? Random blogs, some from artists working in big companies, other from art students around the world. Cartoon network shows, Nickelodeon, stuff from Tartakovsky. 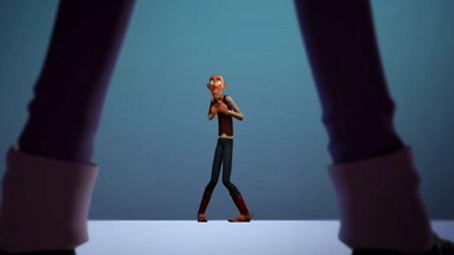 My favorite style of Animation comes from Sony Animation. Cloudy with a chance of Meatballs, Hotel Transylvania. The upcoming "Stork" movie looks good too ! As a kid I was watching what was on French TV : Hanna-Barbera, Looney Tunes, Tex Avery, Chuck Jones's stuff then later the Simpsons, Family Guy.. not South Park. The Road Runner is probably still my favorite. I also liked Tom and Jerry, especially the episodes where they become monsters. I loved that. But to be honest my biggest influences come from live movies and tv shows. There is no animated movie in my top 10 movies. My favourite animated movies are : The first 10 minutes of Wall-E, the first 2/3rd of Paranorman, Nightmare before Christmas, The first half of Cloudy with a chance of meatballs, Spirited Away, Wallace and Gromit and the Wrong Trousers. I really liked some of the latest Disney movies. Big Hero 6, Tangled, Zootopia have the best animation ever and are fun movies to watch. Zootopia especially is a smart movie. But like I was saying to a colleague, each time I watch a Disney movie I have this wish that another studio did it instead, someone who would bring something strong and different. A while ago I read an interview of Tartakovsky on Cartoon Brew and he said great stuff about creating Comedy through movement, not letting CG dictate how realistic your animation should be...It's stuff I felt strongly but was not able to put into words. Brad Bird is an interesting guy too. According to him, Animation is not a genre, it's a medium. It's something that everyone seems to forget easily, even studios that I love like Laika. How was the idea of Muffin Jack conceived? My friends and I did two short movies called "Salesman Pete" and "Meet Buck". These movies got the attention of the boss of ANKAMA in France. He hired all of us to work on the pre-production of an animated TV series he wanted to do. We assumed he wanted us to provide the same style and tone that we had on our short movies. Except he didn't. Because of this artistic misunderstanding, the project failed. Except instead of firing us, he had the generosity of giving us a second chance : We had one afternoon to come up with an original idea for an animated show and pitch it to him. If he liked it, he would keep us and we work on it. If not, we would all be fired. We came up with Muffin Jack, a super spy transformed into a ridiculous muffin by his worst enemy, who has to hide inside a bakery and mentor a young clumsy baker so they can fight crime together. The boss liked it. Checking your career path, your first listed position was working as a 3d animator in March 2009. From September of the same year, you have worked in directing, storyboarding and visual development, until March 2015 where you returned to 3d animation. How have the experiences of these positions, influenced your taste as a character animator? I think this diverse background helps me think about my animation as a tiny part of a whole process. I think about the sequence, the joke, the characters, the visual mood... The animation needs to serve everything else, while still feeling spontaneous. From March 2015, you have worked at Cartoon Network, as a 3d animator on the Amazing World of Gumball. Can you tell us a little about the role? Very blocky à la "Pocoyo", some in 12 frames per second to imitate stop motion, some move like real hand puppets, some have more smooth and classic animation styles, some look and move like clay and some are fully realistic dinosaurs. But all of this is done in Maya, in 3D. 3D animators have to animate props and vehicles too. There's lots of car chases and action in this show ! Please can you talk about your workflow for the piece? For a clip so stylized, did you shoot reference? I didn't record any references. I don't like watching myself. But I kept acting in front of my computer while animating. No mirror or camera. I was just repeating the movements and expressions of the character again and again in order to find what I wanted. I also storyboarded the sequence, with camera movements and key poses correctly timed in 2D before even opening a 3D software. In December 2015, Anim School released Malcolm 2.0 to the public. The popularity of the rig's versatility, particularly for cartoony animation, is celebrated in its use by the top three entrants of this month's competition. Why did the rig appeal to you? It's free. It's very nicely done. It's got customizing options (male, female, clothing, haircuts.) and it's a human being, something that is really missing in my show-reel :) The only missing option would be to drastically change the morphology of the character in order to have a short, tall, muscular, fat, skinny guy or gal. What was your first reaction to the eCritique was provided by Dave Burgess, Head of Animation, on Dreamworks Trolls. Before watching the critique, I was surprised that I won the first place, or even that I was in the top three. I honestly still think some other animations were technically much better than mine. The people who commented on my video spotted its weaknesses immediately. So when I watched the eCritique, I was expecting a more harsh critique. In the end it wasn't that bad :) It was very very useful feedback about stuff that I felt was wrong but couldn't put my finger on it. I am immensely grateful for this. It's awesome ! Do you plan to make any changes after your Ecritique? Some animators do, some like to move forward. But if you did, I'd love to share it. I did fix a few tweaks already but when I look back at my animation, I find it very clumsy. I want to work on something new and integrate from the start the feedback and experience I got from doing this contest. On your clip's description, you've noted that is ''Inspired by true events... probably.'' What is the inspiration behind this story? One of your clip's strength your use of snappy timing. Currently working on a cartoony show myself, my boss emphasis's the importance of rhythm. What advice would you give to somebody learning to develop this in their work? Do you know this feeling when you watch a childhood movie and every dialogue and action seems like a melody to you ? Because you know this by heart and you can predict what's coming next. I think that's the feeling I'm aiming for when I animate. I try to know my shot or sequence so well that it becomes a part of my own experience, through repetition again and again and again. Like an actor learning its lines until they feel natural. I play drums. Playing music helps because it makes me want to be creative with the rhythm, experiment things I wouldn't do instinctively. The audience likes to be surprised by things that happen off tempo. I also sing the dialogue to myself like a crazy person. It helps with figuring out what's "loud" in the shot and what's "quiet". You dont want your cartoony animation to be crazy 100% of the time. It's too exhausting and superficial. You want to create contrasts, surprises, moments of pure fun and moments more subtle and sincere.